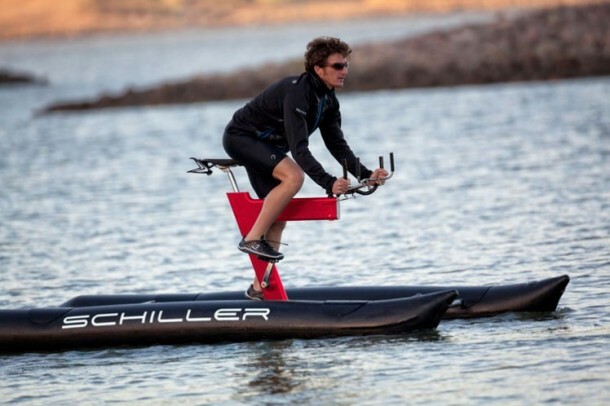 For those of you who don’t remember the US entrepreneur Judah Schiller; he is the guy who crossed the San Francisco Bay on a bike and without using the Golden Gate Bridge. 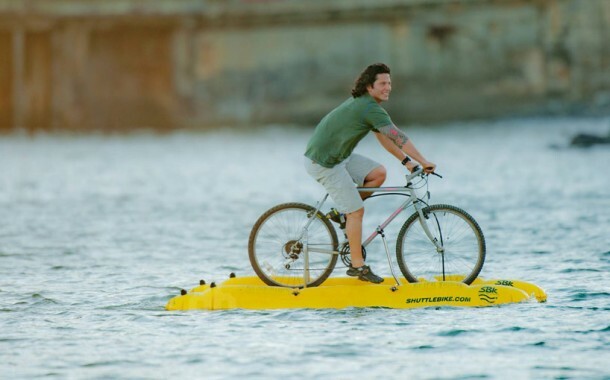 He actually affixed his bike onto a Shuttle Bike kit that basically imparts pontoons and a propeller to the bike. 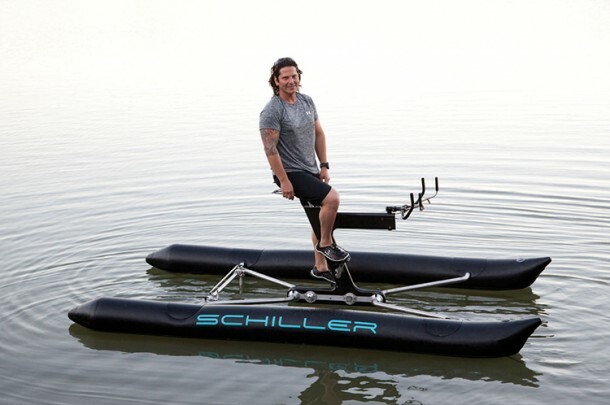 After that feat, Judah has been working in order to come up with a water-bike and the result is Schiller XI. 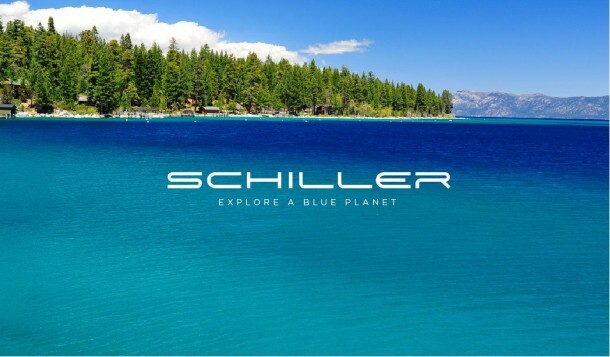 Schiller XI has been unveiled this month and differs from the Shuttle Bike kit by the fact that it has the bike already built into it. There is no need to affix a bike to it and it can be disassembled for easy transport. The frame has been made from anodized aluminum whereas most of the hardware uses stainless steel for its production. 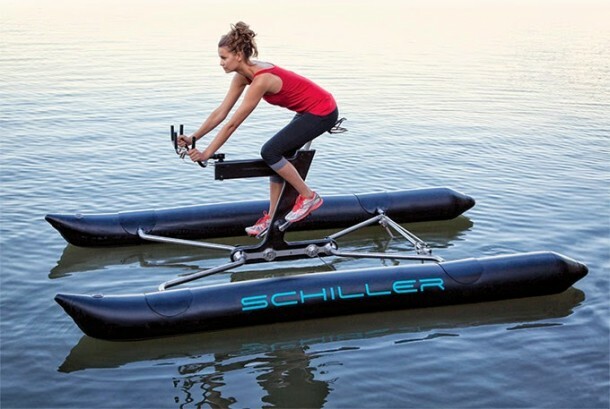 The dual chamber pontoons are made from rubber while the saddle, handlebars, pedals and cranks are similar to the ones found on a conventional bike. Schiller XI comes with LED lighting. By making use of Gates Carbon belt drive, the power is transmitted to a NuVinci 360 transmission and afterwards, this power is used to turn the two propellers that are affixed on flexible shafts. The steering is done by turning the two props either left or right. The whole assembly weighs in at 20 kg and can achieve speed of up to 10 Mph depending upon the capability of rider. The basic version will cost you $6,495 and the limited edition version with chrome plated Founder’s Edition is priced at $8,775. Pretty cool, isn’t it?